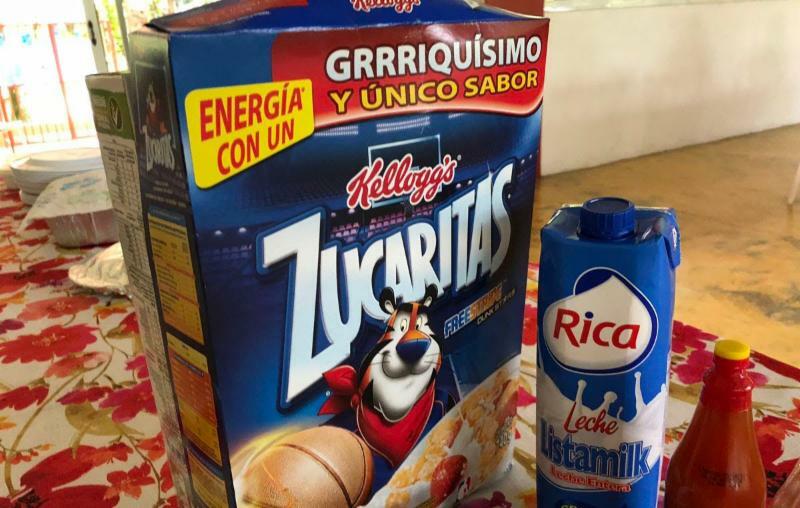 Team Fee of $650 Due April 30: We have received firm cost quotations for our in-country room and board (including the Zucaritas y leche breakfast items illustrated above), transportation, and other costs from the mission team support office in Santo Domingo, and are pleased to let you know that the 2019 team fee will be $650, the same as in previous years. We need to send our payment for those items to the DR diocesan office on May 3 to make sure the funds arrive at the Campamento at least one month before our arrival on June 17, so please send in your payment by April 30 with a note that it is for the "DR Mission Fund - Team Fee." The church's mailing address is at the bottom of this message. Problem in paying this amount by April 30? Check with Julia (email address below). Two information documents are ready for you to review: Communication guidelines, including the use of cell phones and how to contact a team member from the United States if an emergency develops during our trip; and Lessons learned, a compilation of helpful tips and policies that our team has worked on for several years. If you have suggestions that might improve these information documents, please send them in. Both documents are posted on the 2019 planning page. The communication document is here, and the lessons learned document is here. Next week: two more documents, including a suggested packing list. Project funds sent to Padre Canela: Julia and I have sent $1600 from the church's DR mission account to Padre Canela to start two of our projects -- the building of a concrete-block bedroom for Pirlulu and the installation of 16 wall-mounted fans in the second floor dormitory rooms where we stay. Padre Canela has confirmed that he has received those funds, and that he will start work on both projects right after Easter. Leidy, our local translator and all-around solver-of-problems is working with Padre Canela on the bedroom design, and the current design is in accord with her suggestions. She is also one of Pirlulu's first cousins, and first suggested this project when Julia and I were in El Pedregal in October 2018. The goals are to have the fans installed and ready for use by the time we arrive on June 17, and the bedroom almost completed on June 17 so we can swing into action for the final steps, probably laying the concrete floor and painting the exterior and interior walls. We hope to present Pirlulu with his new bedroom during the church service on June 23. Need tickets or information for May 3? : Contact Julia at < juliacariail@gmail.com> for tickets or information about our annual fundraiser on May 3 to support school scholarships and some of our project costs. Tickets will be on sale in the parish hall after the 10 a.m. service on Sunday, April 7.